Holocaust Denial and Critical Thinking. The 8th grade assignment in question. evaluate evidence, and to use ‘critical thinking’ skills. The schoolboard finally apologized for it’s poor judgement as news spread that the language used in the assignment had actually been lifted from a ‘revisionist’ website. In the realm of Holocaust studies, ‘revisionism’ is a euphemism coined by anti-Semites and Neo-Nazis for Holocaust denial. After such an embarrassing revelation, apologies are now flying, and amends are being made. On Monday, the LA Times reported that the eighth grade teachers who oversaw the assignments will be going through mandatory sensitivity training, including a trip to the Museum of Tolerance. Hopefully, the physical evidence of the Nazis’ war on the Jews displayed at the museum will illustrate to the teachers why the assignment was a horribly distasteful mistake. Not quite. This story is about much more than an 8th grade assignment. There are troubling implications here. But first, let’s make one thing clear: I don’t think the schoolboard is run by Holocaust deniers, or Neo-Nazis. As the Anti-Defamation League stated, it seems this case is not a sign of a “larger, insidious agenda.” Instead, this is an instance of a group of people making an incredibly bad, misinformed decision. No evil here; just banal ignorance. But, the banality of the ignorance points to the disturbance. This assignment was intended to be an attempt to get students to use ‘critical thinking skills.’ Critical thinking is a buzzword in today’s world of education. It has nothing but positive connotations, and rightly so. But, here we see a danger. Critical thinking skills can only be developed if we can critically recognize when thought and arguments deserve criticism. Not so simply put, we can’t be critical thinkers when we don’t have critical thoughts to critique. To recognize what stances deserve critical assessment, we need to identify what is worthy of discussion, and what is not. There are simply some opinions that are not worth hearing. The Rialto school board was ignorant. They were ignorant that not all thoughts should be critically assessed, and they were even more ignorant of history. They simply took two seemingly disparate views, and told students to analyze them. After all, to the school board, the ‘revisionist’ website used the language of a critically thought out position. It ‘seemed’ historically sound, which is exactly what the ‘revisionists’ intend. Holocaust deniers want to take advantage of such ignorance; when they do, they win the battle, and help destroy history. The other especially disturbing aspect of this story is the method the board used to get information. 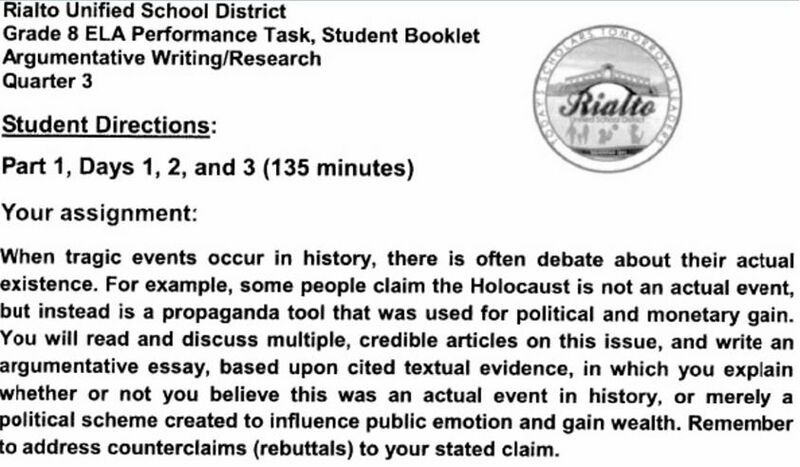 As mentioned, the assignment was taken almost directly from a Holocaust denial website. The board’s ignorance is chilling, but it becomes dangerous when combined with the accessibility of extreme lies in cyberspace. Now, I am not a luddite. The internet has radically altered communication, and accessibility to information largely for the better. But the internet does not separate the noble from the vile. Extreme hate has found a new home on the web. 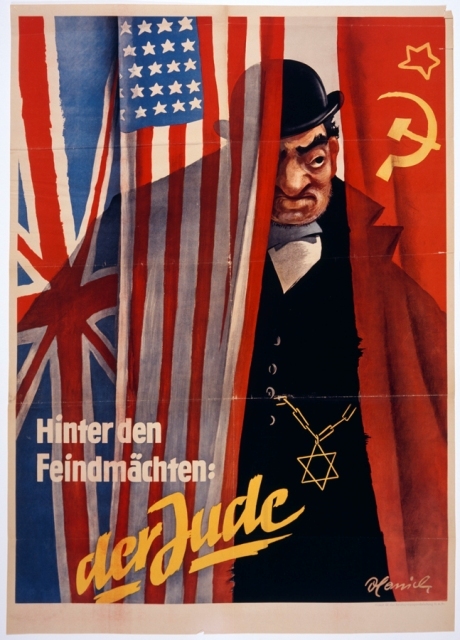 Nazi Anti-Semitic Propaganda poster found in search. search out for the answers to assignments in class. Let me just give you an example how easy this is: If I Google image search ‘Nazi Jewish Propaganda’, I get over 6 million hits. Most images come from the holdings of Yad Vashem, or the U.S. Holocaust Museum, or some other reputable memorial institution. But, the image search also can bring me to other, more troubling sites. The 11th image retrieved in this particular search is of a Nazi anti-Semitic poster produced during the Second World War. If I click on the image, I see that it comes from a page called ‘Zion Crime Factory.’ The small caption to this image states, “Hitler, like Goebbels, understood the reality of Jewish warmongering against the Reich…‘ What we have here is a modern anti-Semitic, perhaps Neo-Nazi site utilizing Nazi propaganda, not to illuminate Nazi persecution of Jews, but to illustrate that the Nazis were actually correct in their persecution. If my students were looking for propaganda for one of my assignments, they may accidentally stumble upon this site. Hopefully they would recognize this site for what it was and avoid it like the plague. But, what about all those who had never studied the Holocaust before, and don’t know what they are looking at? What about 8th graders researching a critical thinking assignment? Especially valuable post by MSJ as we get into selecting books and articles for the Fall start. Well chosen topic and lesson here. As as student in your Holocaust class, I can attest to the fact that you truly do warn us against the insanity that is out there. Further to that the fact that this school board is truly being insensitive is appalling. It is the schools job to teach history, not deny it, or make it seem, insignificant. Kitties, and Puppies, and Babies, Oh My! !